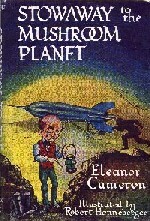 (1912-1996) Eleanor Cameron is a distinguished author and critic, best known for her juvenile fantasy Mushroom Planet Series. She won the National Book Award for The Court of the Stone Children. Here's a popular science-fiction series, with a couple recently back in print, and the rest of them elusive and difficult to find… Ah what a teaser, why don't they just reprint the whole series? But they haven't, and so the demand for the ones which remain out-of-print continues. 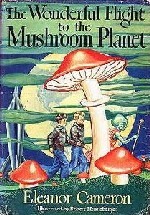 * The Wonderful Flight to the Mushroom Planet. Illustrated by Robert Henneberger. Little, Brown, 1954, 1988. Stowaway to the Mushroom Planet. Illustrated by Robert Henneberger. Little, Brown, 1956, 1988. Mr. Bass's Planetoid. Illustrated by Louis Darling. Little, Brown, 1958. 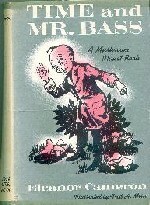 A Mystery for Mr. Bass. 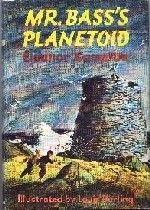 Illustrated by Leonard Shortall. Little, Brown, 1960. Time and Mr. Bass. Illustrated by Fred Meise. Little, Brown, 1967. * A Room Made of Windows. Illustrated by Trina Schart Hyman. Little, Brown, 1971. Julia and the Hand of God. Illustrated by Gail Owens EP Dutton, 1977. That Julia Redfern. Illustrated by Gail Owens. EP Dutton, 1982. Julia's Magic. Illustrated by Gail Owens EP Dutton, New York, 1984. The Private World of Julia Redfern. Illustrated by Gail Owens. EP Dutton, 1989. The Beast with the Magical Horn. Illustrated by Joe and Beth Krush. Little, Brown and Company, 1963. * The Court of the Stone Children. EP Dutton, 1973, 1990. * A Spell is Cast. Illustrated by Joe and Beth Krush. Little, Brown, 1964 and Peter Smith, 1991. The Terrible Churnadryne. Illustrated by Joe and Beth Krush. Little Brown, 1959. To the Green Mountains. Illustrated by James Barkley. EP Dutton, 1975. * The Green and Burning Tree. On the Writing and Enjoyment of Children's Books. 1969. The Seed and the Vision. On the Writing and Appreciation of Children's Books. 1993. The Unheard Music. A novel. 1950.